The following animation illustrates the principle of dynamic buoyancy. Note: You can enlarge or reduce the four sections by using your mouse. 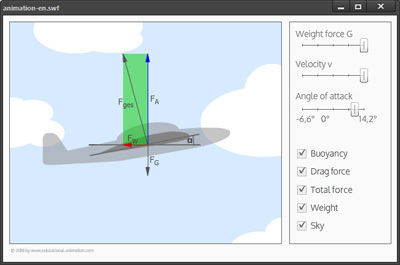 A wing profile (Clark-Y) showing the buoyancy, resistance and total force. In addition, it depicts the force of the weight. Diagram showing the buoyancy and resistance coefficient in dependency to the setting angle. Polar diagram as a representation of the buoyancy coefficient in dependency to the resistance coefficient. The animation demonstrates that even with a flat angle of 0 degrees a high buoyancy still occurs. This fact cannot be explained mechanically (Bernoulli Principle). The animation is based on measured values that have been determined in a wind tunnel with a Clark-Y profile (see source information). Actually is the resistance smaller than in the animation. To illustrate the resistance better and make it more apparent, it was multiplied by a factor of 10.